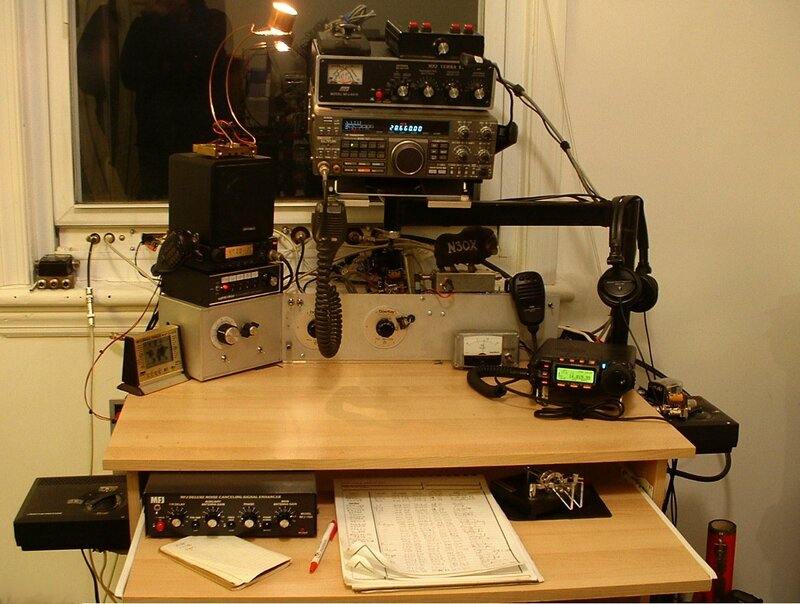 When I got the FT-857D I wanted to move the radios (which were stuck on an endtable) and I figured I'd do it right. I got some cheap furniture at IKEA (since I was going to drill it up anyway, I figured the $19.99 computer desk would work) and came up with this in an underutilized corner of my apartment. The desk at the apartment. Since I moved into the new house and put up some real antennas, I've... um... added a lot more junk. 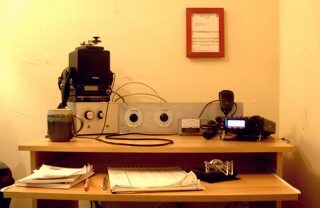 I've got a couple of antenna rotators, another antenna switch for the V/UHF antennas, and decided to find a place to put the TS-440S even though I don't really use it too much, except for occasional simultaneous monitoring of HF and VHF. The leftmost Radio Shack antenna rotator controller turns the 20m/17m delta loop. The stack of gear under the lamp includes a speaker for the FT-857, an Alinco DR-130 FM rig, the controller for a 5 position Ameritron coax switch for the HF antennas, and the servo tuner/vertical matching controller. The box below that on the pull out shelf is a MFJ-1026 phasing unit. 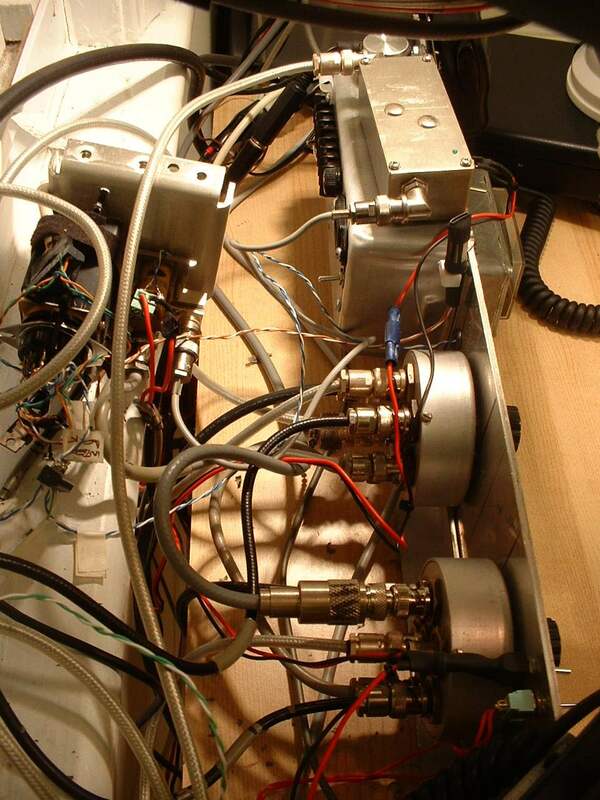 The swivel arm holds the TS-440S, a MFJ 941E tuner, and a CMOS SuperKeyer II. 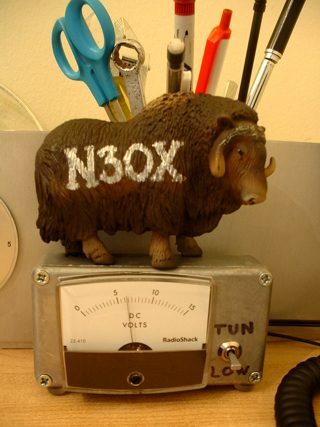 The keyer is for the TS440S, but the tuner is actually connected to the HF port of the Yaesu. The aluminum panel with the two antenna switches mounted on it is now the HF/6m switching matrix. Below is what happens when the left/right switches are in the listed positions. There are a few other toggle switches installed on the aluminum panel. 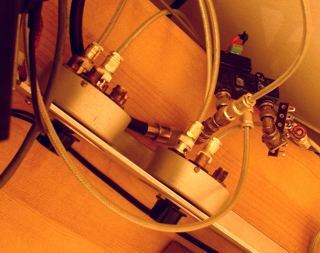 The two on the left are the 17m/20m relay switch and the switch to apply 30V to a bias tee. The toggle on the right near the FT-857's mic is a switch to send the paddles to either the FT-857D or the keyer on the TS-440S. Finally, there's another Radio Shack rotator box that turns the VHF/UHF antennas on the chimney. There's a Bird model 74 antenna switch that can't be seen in this picture to select VHF/UHF antennas. If you've visited other sections of the site, you know it's all about the antennas here at ARS N3OX. The tall curvy thing on the right is, of course, my 60 foot vertical. I swear it looks more vertical in real life. Strung between it and the house is a 10m/15m trap dipole with homemade capacitors in the trap; they're copper foil and teflon plumbing tape and seem to be standing the test of time. In the background is the 20m/17m Moxon on a 28 foot rotatable 6061 aluminum mast whose base sits on the rotator. Well, I can't forget 12m! 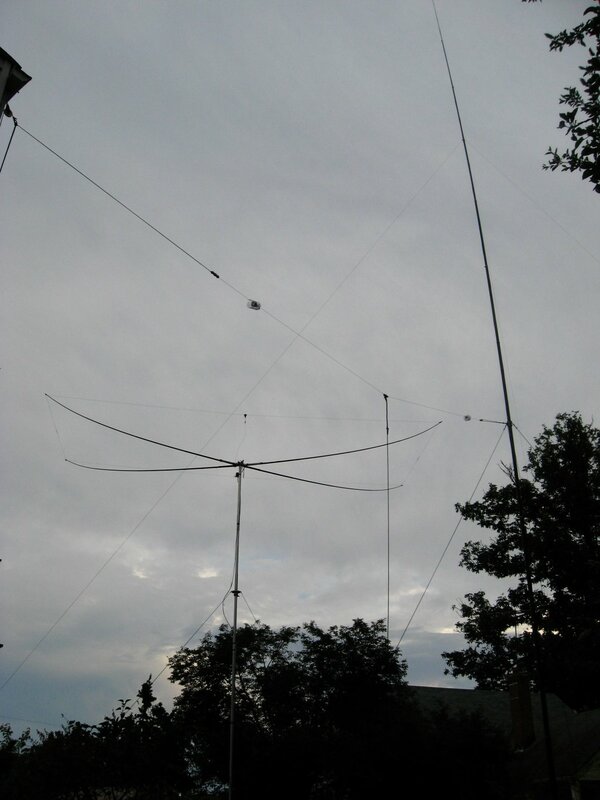 Rounding out the HF bands is this antenna. It's a 12m full wave loop, twice as tall as it is wide. That gives a great match to 50 ohm coax which, in this particular case, is kind of stupid because I'm using RG-6 Quad Shield stuff to feed it ;-). Anyway, this antenna is also useable on 15m and 10m with relay switched matching networks in the grey junction box. It makes a good backup to the trap dipole on those bands partially because I can rotate it to face other directions (South, namely, where the dipole has a null). It also seems to have better signal to noise ratio than the dipole, I think because it's further from the house and better decoupled from my vertical, which seems to pick up and reradiate quite a bit of junk on the higher bands. The gain performance of this antenna and the trap dipole are almost identical (and models suggest that as well). 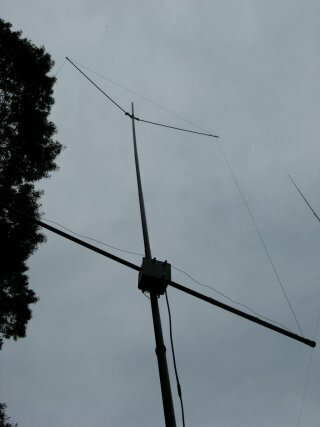 Anyway, this simple antenna was enough to snag VP6DX on 12m (which is what I built it for). At the time, the 10m matching network was not in place; I think if it had been, I would have been able to round out the CW sweep of Ducie. QSL via MU5K/OX; The N3OX official mascot.